Bride and groom share a kiss hidden by trees in St. John, Indiana with sun breaking through. I think our bride Alyssa simply willed away the rain on her wedding day!! It did rain. However, when we were scheduled for outdoor photos the only water we felt was simply dripping from a few tree branches. When The Patrician asked if she wanted to move the ceremony indoors, she said 'nope' and outside it was with no rain. Our day started with bridal prep as I got to know the 10 bridesmaids a little bit as they transitioned from hoodies and jeans to robes to eventually their lovely blue dresses. Bridal preparation at Jay Marie Salon and The Patrician. Alyssa and Dan had a wonderful first look / reveal at Lake Hills Clubhouse and surrounding lake in St. John, Indiana. The 20 person wedding party cheered them on and then second photographer Kerrie photographed the guys and off I went with the girls. First look for the bride and groom at Lake Hills Clubhouse in St. John, Indiana. Bride and groom portraits on wedding day. The soon to be bride and groom live in the neighborhood and I imagine they have visited the lake pier many times. Mother of the bride brought us a chalkboard and we took a few images for their Thank You Cards. Bride and groom at the edge of the Lake Hills pier in St. John, Indiana. Wedding day Thank You sign. The girls stood no chance in their heels with the wet grass, but the guys didn't mind a bit of mud on their shoes. Wedding party at the lake at Lake Hills in St. John, Indiana. Since Alyssa and Dan lived so close, we hopped over to their home for a family portrait with the two dogs. Then it was a limousine ride back to The Patrician for their outdoor, Fall wedding ceremony. A full house with standing room only was present for the outdoor ceremony at The Patrician Banquet Center in Schererville, Indiana. I love the happy, joyous look of the bride and groom just after the first kiss. A large group of friends and family attend an outdoor wedding at The Patrician. An outdoor October wedding ceremony at The Patrician. Alyssa is a nurse and Dan is a police officer and the best man and maid of honor did their best to honor them / roast them by dressing in the appropriate uniforms during introductions. The wedding cake topper had the two dogs make an appearance and the room was beautifully decorated for Fall. 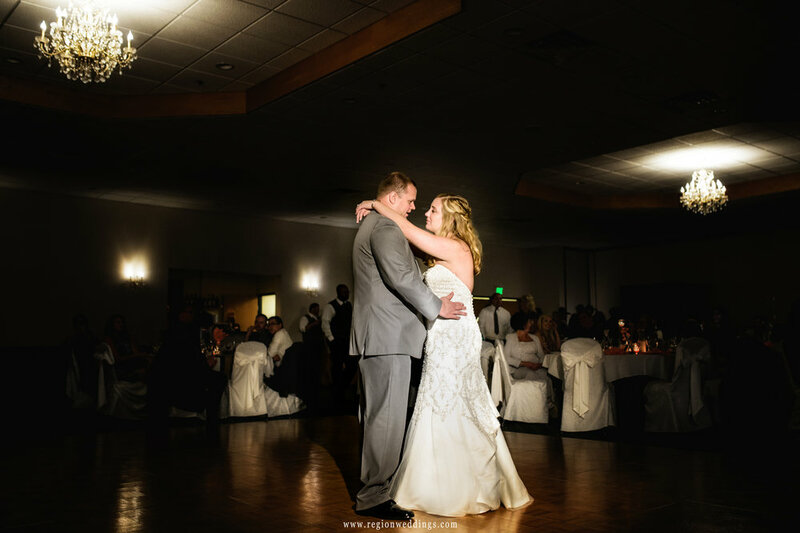 An October wedding reception at The Patrician Banquet Center. First dance for an October wedding reception at The Patrician. I hope you have enjoyed this sneak peek look at Alyssa and Dan's outdoor Fall wedding at The Patrician Banquet Center. Stay tuned to social media for more images. As always, please fill out the Contact Form to inquire about your wedding date.